This strategic CARAVAN exhibition, in partnership with The Episcopal Church Office of Ecumenical and Interreligious Relations, is a creative response to today’s climate of increasing prejudice and stereotyping, which is resulting in a new type of “tribalism.” “ABRAHAM: Out of One, Many” seeks to address increasingly negative views of Muslims and the recent rise of Antisemitism in the West. The exhibition will involve three globally acclaimed Middle Eastern contemporary artists – Sinan Hussein, Qais Al Sindy and Shai Azoulay – from Muslim, Christian and Jewish faith traditions. Each artist has created five paintings that focus on five specific themes from Abraham’s life which can guide us today in our world – artistically interpreting these themes for our contemporary context. “ABRAHAM: Out of One, Many” is curated by Episcopal priest and president of CARAVAN, Rev. Canon Paul-Gordon Chandler. The exhibition will tour for 20 months to heavily trafficked sacred spaces, such as Episcopal and Anglican cathedrals. Premiering in Rome, Italy at St Paul’s Within the Walls Episcopal Church the first weekend of May 2019, the exhibition will then be showcased in the United Kingdom over the summer of 2019, before touring the USA through the end of 2020. 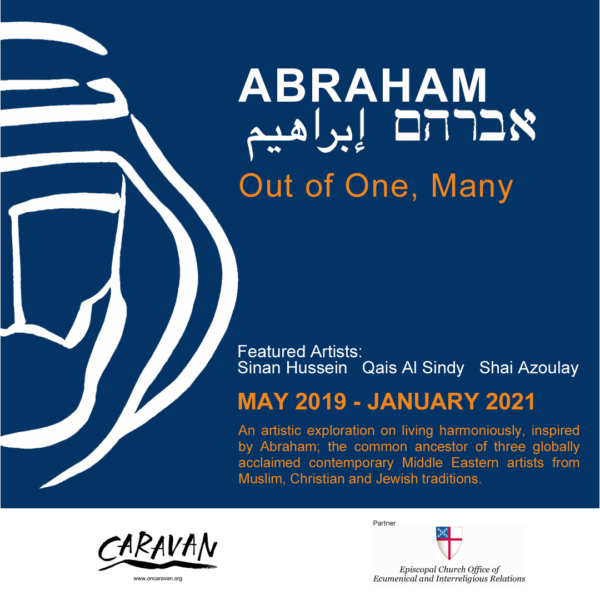 “ABRAHAM: Out of One, Many” serves as a catalyst for each host venue to work with their local Muslim and Jewish communities and to develop programming around it to help address the theme in that respective community. For more information on ABRAHAM: Out of One, Many see: www.oncaravan.org/abraham. For more information about CARAVAN, visit: www.oncaravan.org.